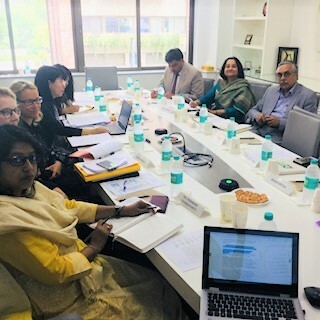 The Delhi Policy Group (DPG), in coordination with the International Labour Organization (ILO) organised a Roundtable discussion on the “Future of Work – ICT Sector”, from 1030-1300 hrs. on July 30, 2018. The ILO’s ongoing future of Work Initiative is one of seven Centenary Initiatives being implemented in the run up to the ILO’s 100th anniversary in 2019. The "Future of Work in Information and Communication Technology” is a global research project and aims to study the anticipated needs for skilled workers and approaches to address shortages by scaling up investments in ICT education and training, as well as better managed migration in the ICT sector. The Roundtable was essentially designed to contribute to this research study through inputs from Indian industry and other experts. 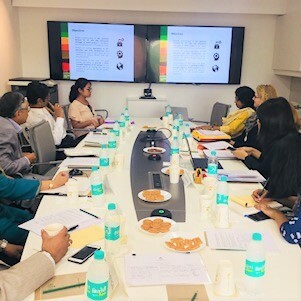 Specialists from the ILO Headquarters in Geneva joined the discussion, along with DEFT Advisory and Research, New Delhi who have been appointed by the ILO to develop the India report. Discussions were moderated by Dr. A. Didar Singh, I.A.S. (Retd. ), Senior Fellow, DPG. Dr. Singh, while welcoming the participants, stressed the importance of the information and communication technology sector (ICT) and digital platforms which today enable work to be done anywhere and anytime. ICT is also an inseparable part of India’s growth and development. There is good scope of employment for ICT enabled workforce and ICT specialists, provided they develop adaptable skills. From the ILO, Hizomi Nakagome made a presentation on the project and outlined the eight sectors which need to be developed including cloud computing, data analysis, VR, IOT, Big Data, AI, RPA and 3D Printing. Experts present stressed the need for skilled workforce suitable and approaches to address shortages by scaling up investments in ICT education and training. India runs the largest skills program through the ‘National Skills Development Council’, but and yet it is true that there are shortages of skills at all levels (low skilled as well as high skilled in ICT) and Indian Industry complains of fresh recruits being under-qualified. Also, there is need to understand the difference between what is automatable and what is actually automated in Industry. Based on this, the future of work shall be different for OECD nations, the BRICS nations and the least developed nations depending on the labour arbitrage in each economy. It was noted that recent ILO studies are pointing towards rising unemployment and underemployment of women in India. This is seen to be a result of rising family incomes and cultural response from males/husbands who put pressure on their female partners to quit work. It was also noted that “Return Migration” has increased in India, mostly in ICT and Finance Sectors. This is the result of declining opportunities in the West and increasing prospects in the Indian economy. The representative of TCS informed that even during a business slowdown, there have been no layoffs, and employment has increased in TCS. Several experts emphasized the need for promoting adequate skills among the youth for better employability. The view that emerged from the Roundtable was that the ICT sector is set to keep expanding and Indian ICT specialists will not be facing any dearth of jobs, so long as continuous upskilling and reskilling is done.